Joseph Duffy meant business at UFC Fight Night 90. 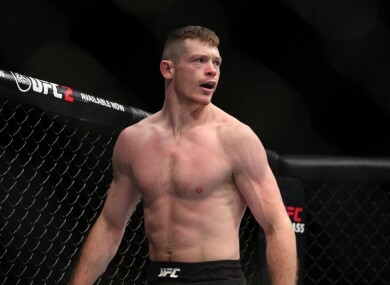 IT’S A CONVENIENT observation to make with the benefit of hindsight, but losing to Dustin Poirier may transpire to be the best thing that ever happened to Joseph Duffy. In his interviews leading into last night’s swift demolition of Mitch Clarke, Duffy stopped short of admitting as much, but you certainly got the sense that he had absorbed each lesson that was yielded from his unanimous-decision defeat to Poirier back in January. Prior to his high-profile meeting with Poirier — which was originally scheduled to headline UFC Dublin last October until Duffy sustained a concussion — the Donegal-born lightweight was careering through the UFC at unprecedented speed on a hype train that was fuelled by a pair of first-round wins that signalled his intent on MMA’s biggest stage. Main-event slots against well-known contenders were what he was aspiring to, but one arrived sooner than anybody expected. Duffy was lauded from all quarters, with fans, fellow fighters and UFC officials singing his praises. Commentator Joe Rogan said a win over Poirier could catapult him into the title picture. But being billed as the finished article after just two fights in the UFC can’t have sat well with a modest, level-headed guy like Duffy, who possesses an insatiable appetite for learning and improvement. He couldn’t have been accused of complacency against Poirier, but perhaps he was paralysed on the night by pressure. Duffy acknowledged that he felt “a little bit flat” against Poirier, admitting that the weight of expectation may have been a contributory factor. But last night, he returned to the scene of the Poirier defeat — the MGM Grand in Las Vegas — and has never looked better. Seldom has any fighter been so impressive in the space of 25 seconds. Wow. Joe Duffy wins via RNC in 25 secs. Poirier exploited a hole in his takedown defence at UFC 195, but we’ll have to wait to see the results of the work Duffy has subsequently invested in that area of his game. Mitch Clarke never had a sniff of an opportunity to pose that question, as Duffy provided another glimpse of why few of his peers in the lightweight division can blend crisp striking with slick grappling as efficiently as he does. With 10 seconds on the clock, the first punch Duffy threw lifted Clarke off his feet and he crashed, facedown, to the canvas. To his credit, Clarke recovered well, reversing to his back as Duffy arrived with another flurry of strikes. But that’s when the Irish fighter’s extensive arsenal revealed itself. Instead of desperately continuing to pursue a stoppage by strikes which Clarke appeared capable of withstanding, Duffy called upon his jiu-jitsu, which he’s been honing under the tutelage of Firas Zahabi in Montreal and John Danaher in New York. Clarke sought to squirm away in the hope of returning to his feet, but before he could even complete that thought process, Duffy had transitioned beautifully to his opponent’s back and the rear-naked choke finish was inevitable from there. It was smooth, it was clinical and it was exactly what Duffy needed. He had spoken before the fight of how the expectation levels had dissipated since he came up short against Poirier, but there was still plenty of pressure. This time he needed to deliver a reminder of his potential in order to remain in the conversation at the upper echelons of the 155lbs division, instead of slipping down the pecking order at a time when consecutive defeats are often enough to convince the UFC to give fighters their marching orders. The win was the 15th of Duffy’s professional career, the 13th in the first round, the 10th via submission and the third in under a minute. It was also the fourth-fastest submission in the history of the UFC’s lightweight division — an emphatic response to a defeat which left many questioning his credentials as a future contender. Between January 2015 and ’16, Duffy was signed by the UFC, went through four full fight camps, fought three times and also endured a lay-off due to a concussion. All the while, he was in the midst of moving his life from London to Montreal. Therefore, affording himself some time away from the competitive arena was necessary and deserved. And in hindsight, it may well prove to be a turning point in his career. Duffy undoubtedly possesses the raw materials and the mindset to weave his way up the rankings, but it may still be important for the UFC to resist the urge to attempt to fast-track his progress again, as was the case when he was matched with Poirier. Due mainly to his brief stint as a professional boxer, Duffy has recorded just five MMA wins — in which he accumulated slightly over 18 minutes in the cage — in the last five years. Given time, his enormous potential can be converted into positive performances and results against the elite lightweights in the world. Having said that, a win over a ranked fighter next is well within his capability. Poirier appears to be heading rapidly towards title contention so he was too big a challenge at that particular juncture in Duffy’s career, but few would bet against the former TUF contestant should he be paired with the likes of Rashid Magomedov, Al Iaquinta or Francisco Trinaldo. Duffy was unlucky to miss out on a ‘Performance of the Night’ bonus too. As he sat beside newly-crowned UFC lightweight champion Eddie Alvarez at the post-event press conference, only one question was directed at Duffy for the course of the media briefing. But perhaps that’s a luxury he won’t be afforded for much longer. With Alvarez’s belt within touching distance, even a prudent guy like Duffy must have been tempted to envisage what it’ll be like if a time comes when he edges into that seat to the right of him, preparing to bring the gold strap back home to Donegal. And that’s where home is for the 28-year-old. He was born and spent his formative years in the north-west of Ireland, before his father’s work commitments brought the family to Wales. Duffy moved to London in his early 20s and is now based in Canada. But a trip back to Burtonport and Meenbanad has never been more than a few months away. Duffy has been subjected for a long time to snide swipes at his claims to Irish nationality from his detractors. Those digs have merely increased as a result of his rivalry with Conor McGregor, which dates back to Duffy’s submission of the Dubliner in November 2010. While Duffy already receives a huge amount of support from the Irish MMA community, the more obsessive element of McGregor’s following who devour every crumb of his propaganda — “He was Welsh Joe, then he’s London Joe and Canadian Joe; then he sees my success and he’s Irish Joe” — have been reluctant to back him. Duffy at last night's post-event press conference. Those who felt that revelling in the aftermath of Duffy’s defeat to Poirier was a vehicle for expressing their devotion to the UFC featherweight champion have failed to recognise what the majority of Irish fans already have — that MMA in Ireland is enjoying a boom period which may never occur again for such a small nation. Ireland already has one UFC champion and Duffy is currently the most likely contender to replicate McGregor’s achievement. For the first 20 years of the UFC’s existence, Irish fighters played almost no part at all. There’s no guarantee, beyond this golden generation, that a similarly barren spell isn’t on the horizon. The paths of McGregor and Duffy may eventually cross again. If that time comes, sides may have to be chosen. But in the meantime, even if you’re a subscriber to the gospel according to McGregor, savour the fact that two of the most promising and entertaining fighters in mixed martial arts today are flying the Irish flag. It’s okay to have a foot in both camps. A patriotic guy like Conor McGregor will surely understand. Email “Joseph Duffy issues timely reminder that there's more than one exceptional Irishman in the UFC”. Feedback on “Joseph Duffy issues timely reminder that there's more than one exceptional Irishman in the UFC”.